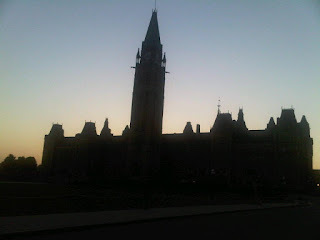 I was in Ottawa yesterday. I do my sightseeing at dusk. I reviewed "A Whole New Mind" by Daniel Pink a while ago. A friend emailed me a talk he did on motivation that I thought was excellent. It is 10 minutes which is a bit longer than I like but the message is excellent, thought provoking and controversial. What I find interesting is people are not even clear in their own mind what motivates them and often say it is money when really it is not. Short blog post today because I believe in the power of brevity (and I am busy). Pink has another book, called "Drive", which is about motivation (and probably a literary version of his talk - haven't read it yet though, it's next on my list).